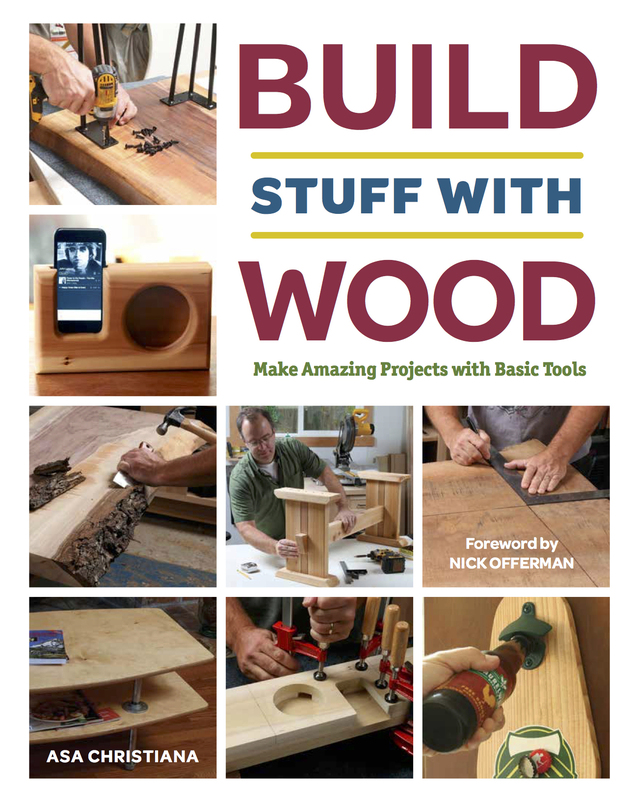 My first book is out and it’s aimed at anyone looking for easy yet totally useful and stylish projects for woodworkers of all levels. Look to the right for more info. But my second book, due out in fall of 2018, is going to be a whole different deal. Yeah, there will be wood in there, and this project is a good example, but it’s really about every part of the new maker movement, from micro controllers and LEDs to IKEA hacks to a rediscovery of traditional materials like leather, steel, and concrete. What will be exactly the same about both books is how easy and accessible yet brag-worthy and badass the projects will be (that’s the plan, anyway!). This sweet six-pack caddy is a perfect example. Anyone can make this using simple tools and free wood, but it will add handcrafted style to your life. I sized it to accept all sizes of bottles and cans, from old-school shorties up to hip 22-ouncers, and I spaced the slats to show off the labels. Inside is a separate grid made from thinner oak slats (thanks, Home Depot), which keeps the bottles and cans from rocking and rolling before the music starts. I also added a classic Starr X bottle opener on one end, so I never have to search for one. This project is so easy to make it could be your very first attempt at woodworking. You’ll need a fat drill bit or hole saw to make the holes for the dowel, almost any kind of saw to cut out the pieces, and then it all goes together with a hammer and nails. I’ll show you a few tricks to make things easier, but you’ll be cracking open your first IPA in no time. I can’t wait to roll up to my first party with my new creation in hand, packed with an enticing collection of flavors and brews—something for everyone. Despite the simple tools, materials, and techniques—or maybe because of them—it looks awesome. I might use a wood-burning tool to burn an image of Gandalf (LOTR fans, holler) onto one end. Seriously. For decades now optimistic, frugal folks have been exhorting others to build projects with pallets. I applaud their passion and pluck, and I love a free stack of boards as much as the next maker, but I’ll kick off my own pallet-wood project with a caveat: While it’s true that pallets are free and widely available—in the biggest cities and smallest towns—this rough material is not right for every project. As you might imagine, pallets are built to be strong and not much else. So the wood is roughsawn, full of knots and defects, and varying in width and thickness, even in the same board. Wood species—usually red oak or Southern yellow pine (a hard softwood)—are chosen for strength over style as well. And last, the pallets you’ll find in the free pile are usually outdoors, with dirt and grease ground in. All that said, a little brushing and sanding goes a long way, and you can clean up pallet boards for all sorts of rustic projects, like outdoor planters, funky frames, a weathered rack for a row of coat hooks, or the sweet tote in this chapter. The key is to lean into the imperfection, embracing it as part of the appeal. Rustic is the rule. I wouldn’t pull a bunch of boards off a pallet, run them through a planer (if you have one), and try to build fine furniture with them. The sand and grit will trash your planer knives, and, in the end, the low-grade wood won’t look that great anyway. There is no point using gnarly pallet wood when inexpensive boards from the home center will be more appropriate for the project at hand. Embrace the roughsawn, weathered look, and let your imagination wander. For example, I’ve seen stylized flags made from pallet wood, with the boards turned into stripes by applying a diluted wash of latex paint in different colors. I’ve driven by lots of “free pallets” signs from coast to coast. For this project, however, I was on a deadline, so I scrolled through craigslist to see what I could dig up in a day. I found six Portland citizens begging me to haul away their pallets, so I dug through the sketchy photos to find the best bets. Be aware that some pallets are totally trashed, often with only a few scraggly boards still hanging on. It took some digging and re-stacking, but near the bottom of the dirty pile of pallets I found on my first stop, outside a restaurant in North Portland, there were two winners: a standard pallet with thin slats for the sides of the caddy, and a custom pallet with a semi-clean row of 3/4-in. boards on top. And one—just one—was wide enough to let me make the caddy I had designed. When you lock horns with your first pallet, your inclination will be to start pulling nails, and/or yanking off entire boards. You have encountered another reality of the pallet game: Aiming for strength at all costs, pallet-makers use ring-shank nails that are a nightmare to pull out. I’ve heard tell of pallets joined with staples, making the boards easy to remove, but I haven’t found one of those unicorns yet. There are lots of ways to defeat the nails—just ask Google—but none are fun, and you’re likely to split or damage as many boards as you save. If you can avoid pulling nails or pounding boards loose from the back side, I say do it. My favorite way to harvest pallet wood is the simplest: Run a circular saw along the top of the slats, as close as possible to the frame pieces below, and the slats just drop free. You end up with pretty short pieces, but for projects like this one, those are perfect. If you need your pallet boards full length, there are ways to separate them from the beams below, such as sawing through the nails from the back side, by slipping the blade of a reciprocating saw between the slats and frame. You can also bang the boards loose from the back side. I’ve also seen specially welded pry bars for the purpose. Alrighty then, let’s get to it. By far the easiest way to remove boards from a pallet is to saw them off. You’ll get shorter planks, but you’ll get them in minutes. Start by laying out one end. It’s 6-3/8 in. wide and 13 in. tall, and the angles start about 7-1/2 in. from the bottom. Lay out the hole to fit whatever dowel you are using for a handle. Drill the hole first. I used a Forstner bit sized for my 1-1/8-in.-dia. dowel, and I clamped a waste piece below so the back of the hole didn’t chip out. You can make every cut on this project using a jigsaw. After smoothing the edges with a sanding block, just use the first end to lay out the second one. The caddy is 11-3/8 in. long, so the dowel and slats all get cut at that length. Simple! You’ll need to trim the side slats 2 in. wide, and also trim one of the bottom slats so you get a good fit down there. I did this on the tablesaw, but the jigsaw would also work. Assembly is a cinch. Use 16-ga. by 1-in. panel nails, which have a serrated shank so they hold super well. But drill first with a 1/16-in. drill so the nails go in easy and the wood doesn’t split. Lay the caddy on its side to attach all the slats. These oak slats are 1/4 in. thick and 3-1/2 in. wide, just the ay they came from the home center. The first step to making the interior grid is cutting the pieces a little shorter than the interior of the caddy. Then chop a little bevel on the top corners of the pieces. I used my miter saw but a jigsaw or handsaw would also work. The trick to laying out perfect notches is to use a shop pencil to trace around the actual pieces. Go a bit more than halfway across the pieces with the slots so you can be sure they will come together fully. Cut along the inside of your lines with a jigsaw and nibble away the end to get rid of the waste piece. Try the fit. You can always use the jigsaw to nibble a bit more off the side of a slot. Once the fit is good, add some glue to the mating surfaces and assemble the pieces on a flat surface, so they end up flush at the top and bottom. The grid just drops in and looks sweet. Add a bottle opener on one end, load up your cool tote with tasty craft brew, and you’ll be everyone’s favorite party guest. Occasionally we stroll through one of Portland’s upscale grocery chains, on the lookout for a funky gift or an unusual snack. This time it was just before Mother’s Day, and my wife spotted some beautiful wall-hung boxes for succulent plants. “$35 a pop? !” I said (so romantic). “I can make three of those for that!” She has heard this tune before, but she has learned to trust me (mostly!). I love these challenges. The boxes were just rough cedar boards with a few pieces of galvanized metal inside the front face to hold in the soil and let the plants peek out. So off to the home center I went, with only a few days before the big day. I found the perfect roughsawn cedar boards for the job (sold as fence slats), but couldn’t spot any sheet metal I liked for the front. So I decided to use wire mesh instead, backed by sphagnum moss, hoping it would hold in the soil and look cool. Lucky for me, it worked amazingly. As for the boxes themselves, they couldn’t be simpler. My only trick was making them 11×11 so two 5-1/2-in.-wide cedar boards would cover the back. A tablesaw or bandsaw would be the best tool for cutting the wide cedar boards into the narrower pieces you’ll need for the sides of the box and the strips on top, but you could also do it with a jigsaw, or a handsaw and elbow grease. For those tools, mark a pencil line to guide you, and clamp down the workpiece on the edge of a table or workbench (vs. trying to hold it by hand). As for chopping everything to length, I used my miter saw, but a jigsaw or handsaw would work there too. Here’s a low-priced handsaw that is really amazing, available at most home centers. It is a pullsaw, meaning it cuts on the pull stroke, so take the weight off it when you push it forward. You’ll also notice that I used an air-powered nail gun to assemble the boxes, but a normal hammer and finish nails would work fine. You might want to predrill the top pieces to avoid splitting the wood. The boxes were done by Mother’s Day, as promised, but not quite ready to hang on the wall. The last important tip is to leave your boxes lying flat for a couple weeks after you build them, to allow the succulents to root before hanging them up sideways. I was nervous when I hung the three planters, but it has been two weeks now and no plants have plummeted to earth! Oh yeah, you’ll also need a mist bottle. Your boxes will need an occasional spray to keep the plants thriving. One roughsawn cedar fence board is enough for each planter. After cutting the box pieces to width, I assembled them in minutes with my trusty brad nailer. A hammer and finish nails would also work fine. The boxes are 11×11 in., so two full boards should fit nicely across the back (they are 5-1/2 in. wide). I oriented the boards so they help hold the box joints together. Potting soil has lots of good fertilizer for happy plants. The next step was a flat layer of sphagnum moss along both sides, leaving an open strip where the plants will go. It was fun arranging the nine little succulent plants in the three boxes I made. I used wire mesh with a 1/4-in. grid, cutting it to size with my good snips. A wire cutter would also work. The mesh gets tucked under the leaves of the plants and should reach almost to the edges of the box. Then the strips get nailed down to hold it in place. The nails actually go through the mesh. To hang the boxes, I screwed little eyelets into the sides (drilling tiny pilot holes first), and then attached picture wire as shown: through the eyelets then wrapped and snipped. After leaving the planters face-up for a couple weeks outdoors to let the plants root in the new soil, I found a stud in the wall, drove screws, crossed my fingers and hung the boxes. So far, so good! With the gate frame done and the 1/2-in.-thick boards for the lower panel ready to go (go here for part 1 of this project), I was ready to assemble the whole door. Soon my awesome fence would have an awesome gate to keep my dog in! (Go here for the fence project.) That cool-looking upper grid would be too difficult to build before the door was together, so I saved it for later. I had a good plan for how to build it and hold it in place in its upper rectangle of space. The first step for any glue-up is a dry fit, where you put everything together without glue, so you know all the joints will end up nice and tight and you have the clamps you need to get the job done. So let’s get to it. Mine is a big door, 4 ft. wide and 6 ft. tall, so I needed to use threaded connectors to extend my pipe clamps. Those let you use threaded plumbing pipe to make any length of clamp you need, using normal pipe clamp hardware that also screws on. I used the dry fit as an opportunity to rout the 1/4-in. roundovers on the inside corners of the frame. If I tried to do it when the parts were separate, it would be hard to know exactly where the horizontal rails meet the vertical stiles, and where I need to stop and start the roundovers. The first step before putting glue in the mortises (lots) and on the tenons (thin coat) was to insert the flat boards into the two lower rails. I popped a nail through the frame and into the top and bottom of each board, just to hold them all roughly in place as they shrink and expand through the seasons. If you really want perfection, you could mill tongues and grooves into the edges of the boards, or shiplap them, so no gaps ever appear later. Next I applied glue to all the joints and added the vertical stiles and the top rail, using the clamps to draw the pieces together. The nice thing about Titebond III, other than it being waterproof for outdoor use, is the longer working time it offers (at least 15 minutes) for tricky glue-ups like this one. Another good trick is squirting a bunch of glue into a plastic bowl like this one, so it is easy to brush on. When I’m done I just let the leftover glue harden, flex the bottom of the bowl, and pop it out. Before I made the upper grillwork, I nailed some thin strips into the back of the opening, which will serve to hold the grid in place. Those L-shaped plywood pieces act as temporary stops for these strips, so you know exactly where you are locating them. Here is the amazing tablesaw jig that is the key to all the little half-lap joints I needed. As you can see at left, the vertical pieces just need two little notches top and bottom. I did those with the miter gauge, using the rip fence as the stop. But the four long horizontal pieces needed a ton of notches in them, all perfectly spaced. For that I made this little sled that I clamped to the miter gauge. I dadoed an extra strip into the base as shown, as a sort of key. Then, once you cut one notch in a strip, that notch fits over the key, positioning the strip perfectly for the next cut, and ensuring even spacing all the way down the line. Because I made all the pieces just the right length, the whole grid dropped right into place, letting me nail some more 1/4 in. strips in front of it to hold it in place. If I ever have to remove it or remake it, I’ll just pry out those strips. The finished grid catches the light beautifully. Note that the horizontal strips are 1/16 in. thicker than the horizontals (5/16 vs. 1/4) to create nice shadow lines. I love the way the whole thing works together. It will be even nicer when the cedar weathers to a silvery grey, much like the color of the galvanized fence panels. Pay no attention to the upper hinge. The upper rail of the fence got in the way. Perfectly imperfect–that’s what I say. When I replaced our old dilapidated wood fence with my own funky blend of wood and galvanized metal, I put a Japanese-style arch over the gate opening, planning to cook up an actual gate in the same style. I’ve learned not to rush the design stage, so I visited the excellent Portland Japanese Garden, took pictures of the gates I found, and also did some digging in Google images. This gate, with falling ginkgo leaves pierced through the lower panel and a traditional Japanese gridwork pattern up top, is the result. I’m now a proud owner of a PantoRouter, and I knew that the big, perfect-fitting mortises and tenons it produces would be perfect for my wide gate. Water and weather are hard on gates, and over the years they tend to sag. So I chose 1-1/4-in.-thick cedar for the frame, just thick enough to accommodate sturdy 1/2-in.-thick tenons but not an ounce heavier than it needed to be. I made all of the tenons the full 2 in. long that the PantoRouter allows. You probably don’t have that machine, so just make the the joints any way you know how. Adding to the strength, I designed the rail widths for a single wide tenon in the two upper rails, and a two-tenon array in the wider bottom rail. A wider bottom rail also just looks good in a big frame-and-panel assembly, grounding it somehow. All of this adds up to eight deep, thick mortises and tenons, four down each side of this wide door, plenty to keep it square over the years. I won’t go through every mortise-and-tenon step, but once you know how to make a big sturdy frame like this, you can design any gate you like. I my case I filled the lower frame with 1/2-in.-thick cedar boards. Those are lightweight and would be easy to pierce with the ginkgo leaf pattern I had in my head. You can see how I did the leaves below. I didn’t want gaps to appear between the boards over the years, so I fired a brad through the frame into the end of each board, top and bottom. A single brad or finish nail will do in each spot, letting each board shrink and expand without moving around much. In the next part, I’ll show you how I glued up the gate and made that cool grillwork for the top. It was a real blast working with those tiny pieces. I used single tenons in the two top rails. The PantoRouter nails the fit with no fiddling. I managed to fit two tenons into the lower rails. Again the PantoRouter is awesome, making double mortises and tenons as easily as single ones. To accommodate those boards that make up the lower panel, I needed to cut grooves in the vertical frame parts, from the lower mortises to the middle ones. I went 1/4 in. deep with two passes, to get a 1/2 in. deep grooves. The lower and middle rails needed grooves too. I found nice silhouettes of ginkgo leaves on Pinterest, scaled them on my printer, glued them to some cardboard, and cut out these two templates, which are slightly different sizes. Then I laid out the boards in their actual array, and played with the templates until I had the falling, windblown array I was going for. Enter my trusty jigsaw. To make it around these tight corners and curves, I dropped in my narrowest blade. Just drill holes for access, and make a series of cuts to shape each leaf. Sandpaper is the great fixer. I wrapped some 80-grit around a dowel to smooth out the bumps and tight curves. I also sanded away the whiskers at the edges. Stay tuned for part 2!